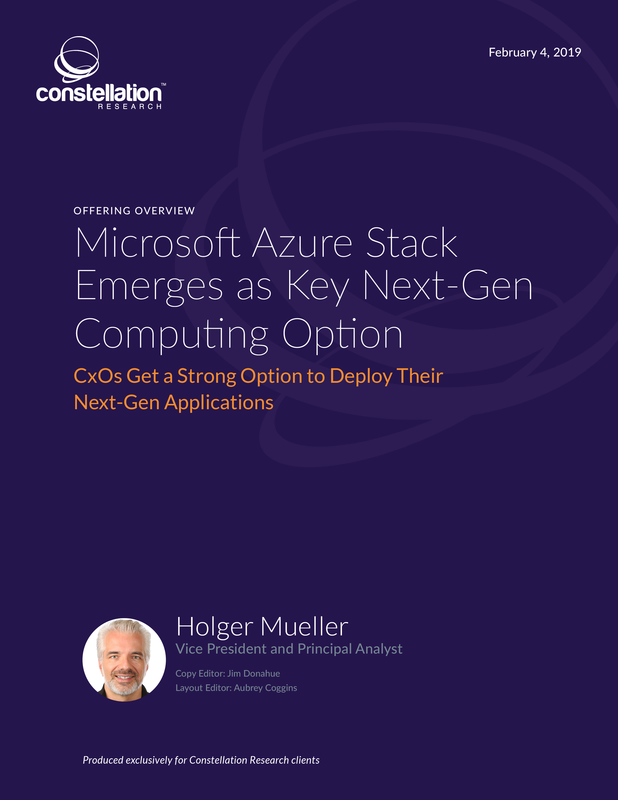 Microsoft Azure Stack Emerges as Key Next-Gen Computing Option | Constellation Research Inc. This Offering Overview provides an in-depth look at Microsoft Azure Stack and analyzes its ability to deliver a next-generation computing platform for enterprises that can deploy workloads across on-premises equipment and the public cloud. Microsoft Azure Stack does this well, thanks to Microsoft’s prominent success in reaching a high level of identicality between Azure and Azure Stack. Identicality allows enterprises to move workloads from the cloud to on-premises equipment with minimal effort. Microsoft’s degree of identicality compared with the vendors surveyed in the related Market Overview is second only to Oracle Customer Cloud; it exceeds the identicality levels of AWS’s offline portfolio, Google GKE On-Prem and IBM Cloud Private.